ISLAMABAD, Aug 31 (APP): Speaker National Assembly Sardar Ayaz Sadiq on Wednesday said Pakistan confidently counts on Chinese support at international forums and genuine economic development. Referring to the historic brotherly relations between two the nations, the Speaker remarked that the international community cannot offer a precedent of Sino-Pak ties. He was speaking to Chinese Ambassador Sun Weidong who called on him at Parliament House, according to a press release. Matters of mutual interests and strategic environment in the region came under discussion. Ayaz Sadiq highlighted that based on shared geopolitical, economic, historical and strategic interests, Pak-China relations have always stood the test of time. He termed the alliance of two friends as highly imperative for responding to regional and global challenges. He stressed the need for cementing people-to-people contacts to take bilateral relations to new heights. Ayaz Sadiq said that the completion of China-Pak Economic Corridor (CPEC) will change the destiny of the region and will usher a new era of Pak-China relations. The Speaker highly appreciated Chinese assistance for enabling Pakistan’s Parliament to switch over to solar power for meeting its electricity requirements. He urged the need for forging partnerships to fast track progress on meeting Sustainable Development Goals and promotes genuine human development at all levels of the society. Ayaz Sadiq highlighted that Pakistan seeks Chinese assistance in exploration of renewable energy resources and enhancement of manufacturing capacity of the Pakistani industry. He remarked that CPEC will give a new impetus to Sino-Pak business relations. Sun Weidong endorsed Ayaz Sadiq’s views that the Pak-China relations had no precednet in international community. He said that China is committed to an enduring partnership with Pakistan and aspires to further strengthen the existing brotherly relations. 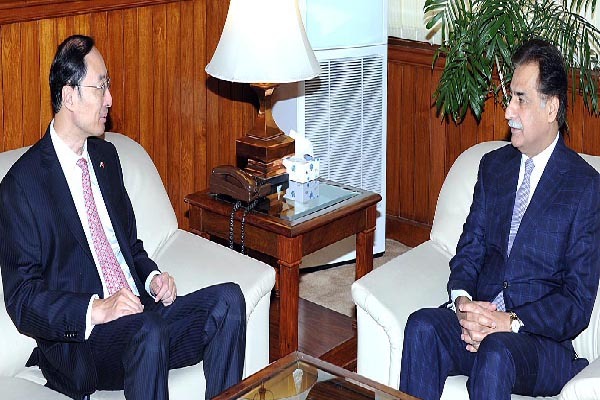 Sun Weidong said that China will continue to assist Pakistan in technology, defense and infrastructure development. He highlighted that the strategic calculation and environment in the region have pushed Pakistan and China into an unflinching bond.